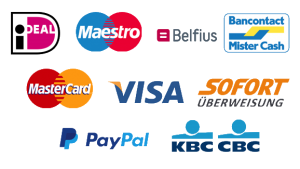 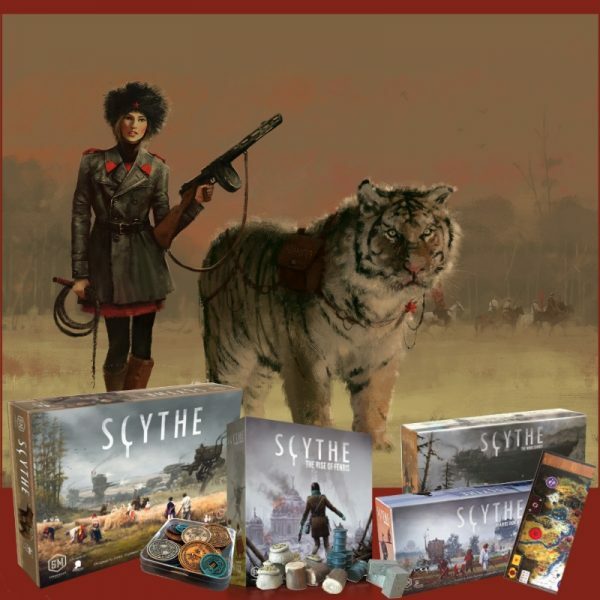 Deze bundel omvat het basisspel Scythe, evenals alleuitbreidingen en accessoires aan een voordelige prijs. 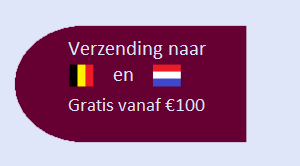 Het gebruik van kortingscodes is uitgeschakeld voor gebundelde producten. 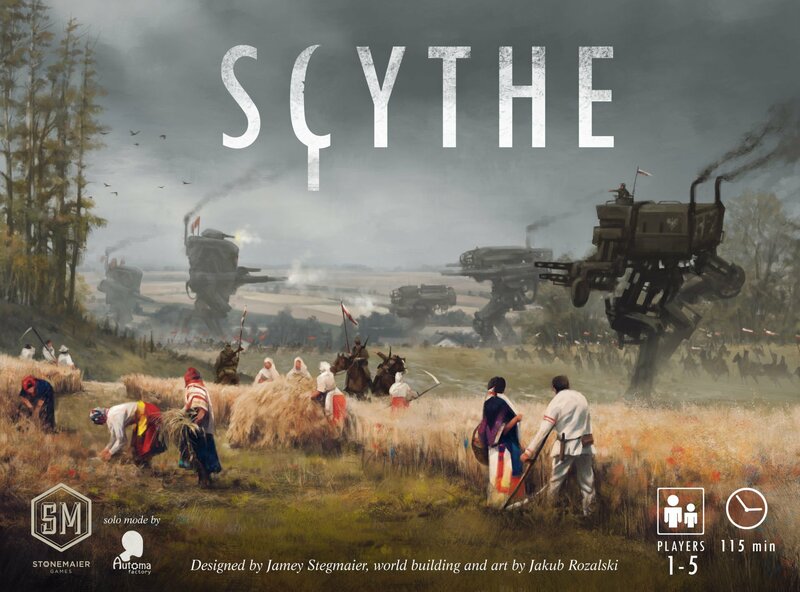 Scythe is an engine-building game set in an alternate-history 1920s period. 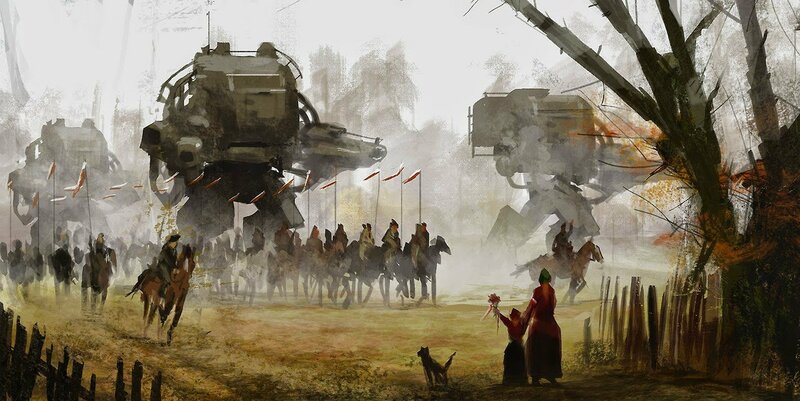 It is a time of farming and war, broken hearts and rusted gears, innovation and valor. 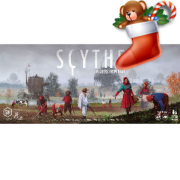 In Scythe, each player represents a character from one of five factions of Eastern Europa who are attempting to earn their fortune and claim their faction’s stake in the land around the mysterious Factory. 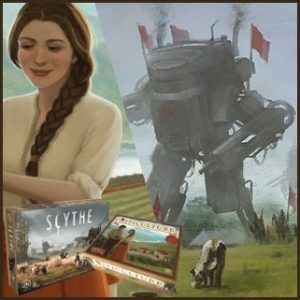 Players conquer territory, enlist new recruits, reap resources, gain villagers, build structures, and activate monstrous mechs. 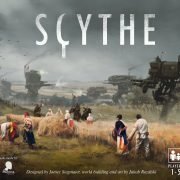 Scythe: Invaders from Afar: While empires rise and fall in Eastern Europa, the rest of the world takes notice. Two distant factions, Albion and Togawa, send emissaries to scout the land and employ their own distinct styles of conquering. 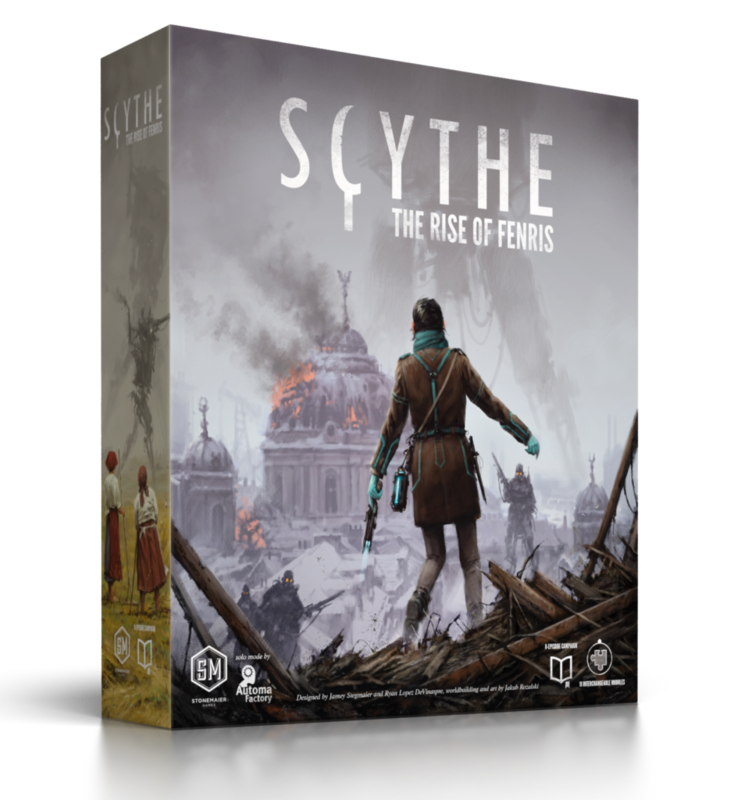 1 custom plastic insert designed to fit into the expansion box or the original Scythe box. 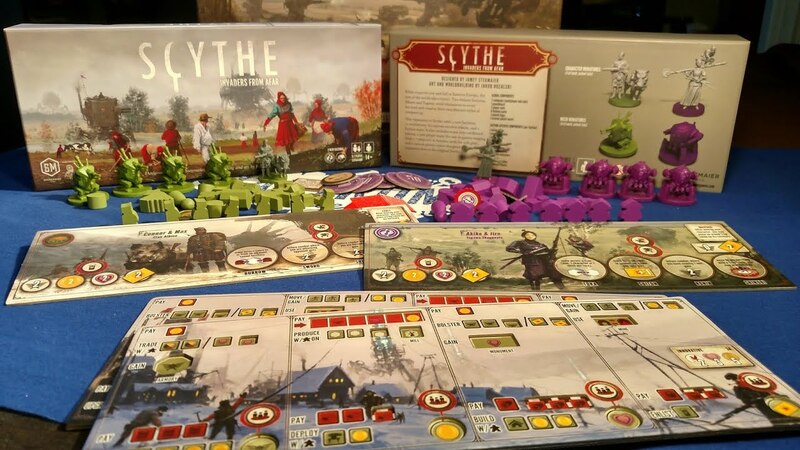 The expansion works seamlessly with any version of Scythe (i.e., if you have special resource tokens, that’s fine–the expansion doesn’t have any resource tokens). 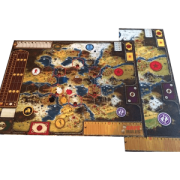 Originally the game was to be capped at 5 players, but I wanted to include 2 new player mats in the expansion. 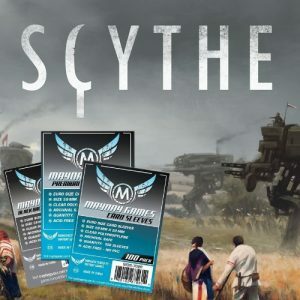 I realized that some people were going to use the mats to play 6-7 player games no matter the what the box says, so I needed to make sure the game worked for them! 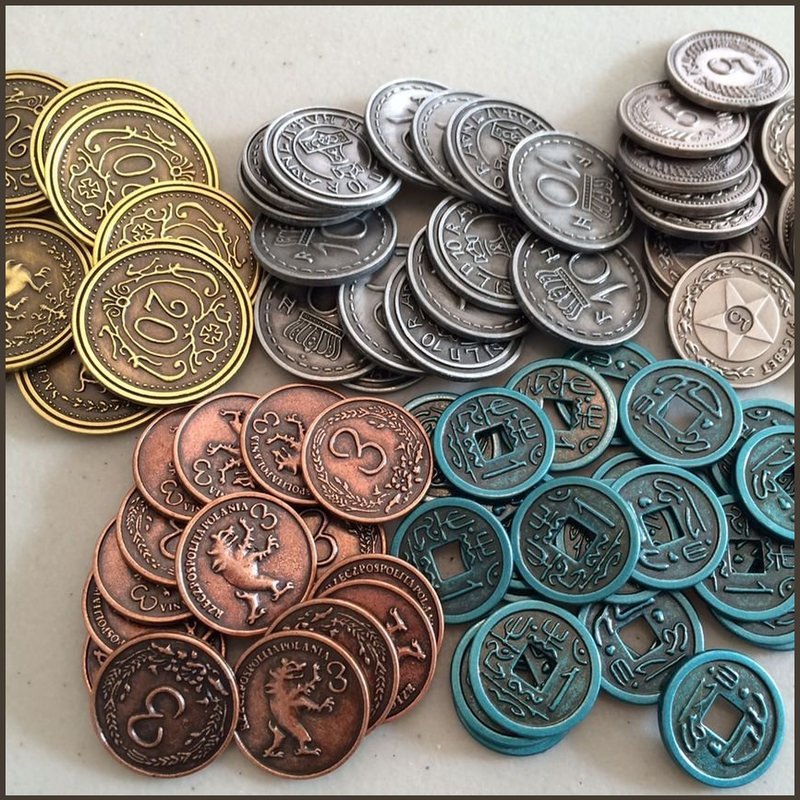 To scale up, the expansion includes alternate abilities for some of the original factions. 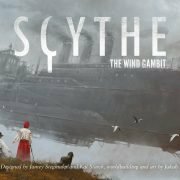 Mankind has long been confined to travel by land and sea, but a new technology has emerged from the greatest minds in Eastern Europa: airships. 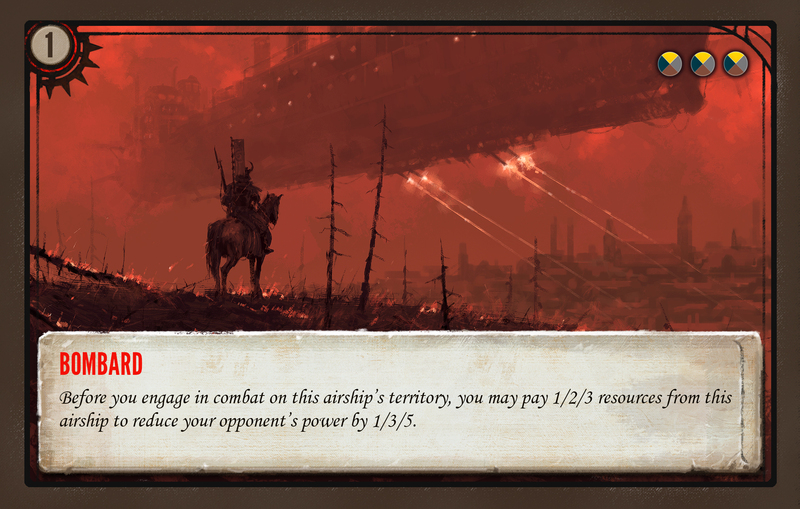 These steam-driven behemoths sail freely across the sky, aiding their empire’s expansion through innovation and confrontation. 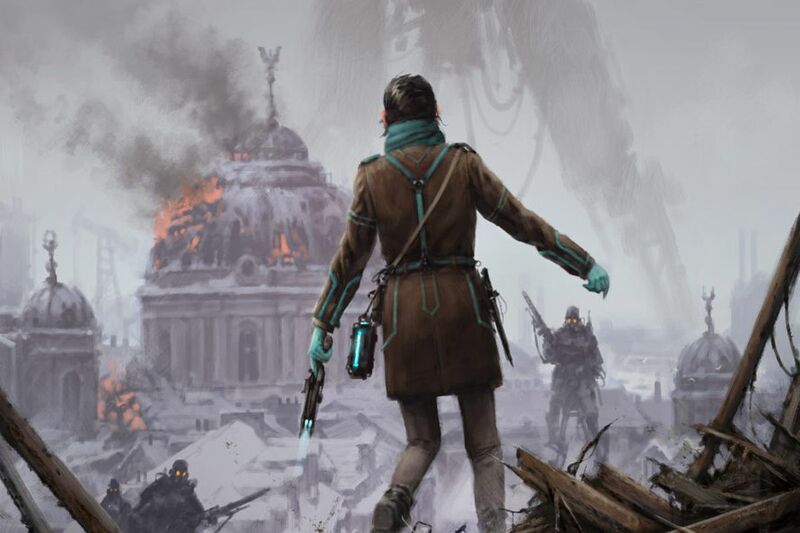 As the years pass, the world has come to understand that no single faction will rise above the rest for any span of time. In the hope of decreasing the conflict and increasing the peace, leaders of Europa begin to gather each year to declare a new way for the factions to resolve their differences. This Scythe bundle set includes the realistic resource tokens (made out of resin or zinc) found in the Collector’s and Art Connoisseur Editions of Scythe. 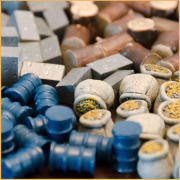 They are to replace the wooden resource tokens that come in the retail version. 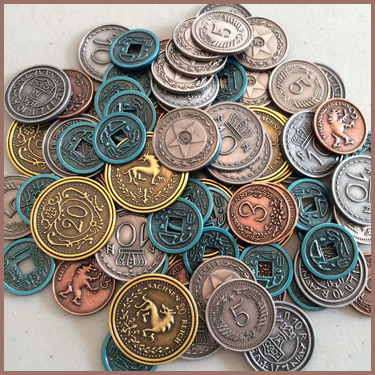 80-Piece Set of Custom Metal Coins, perfect for Scythe by Stonemaier Games, or for many other games that would look and feel great with high-quality metal money! 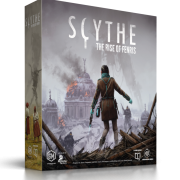 Empires have risen and fallen in the aftermath of the Great War, and Europa stands on the precipice of a new era. 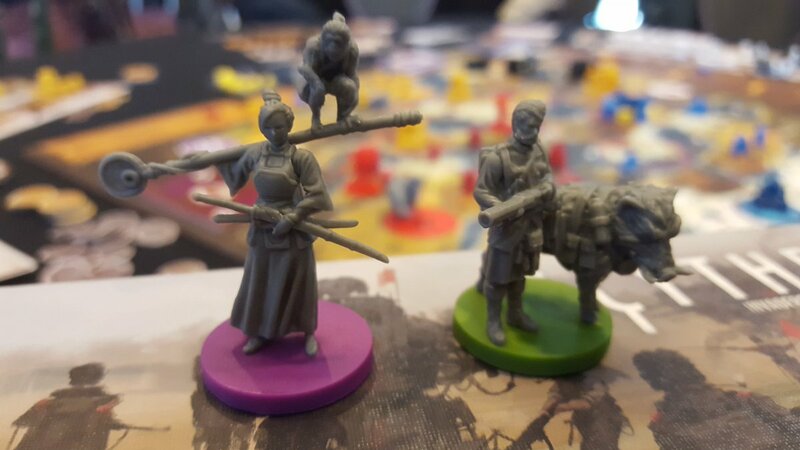 The economy is robust, morale is high, and defenses are strong. 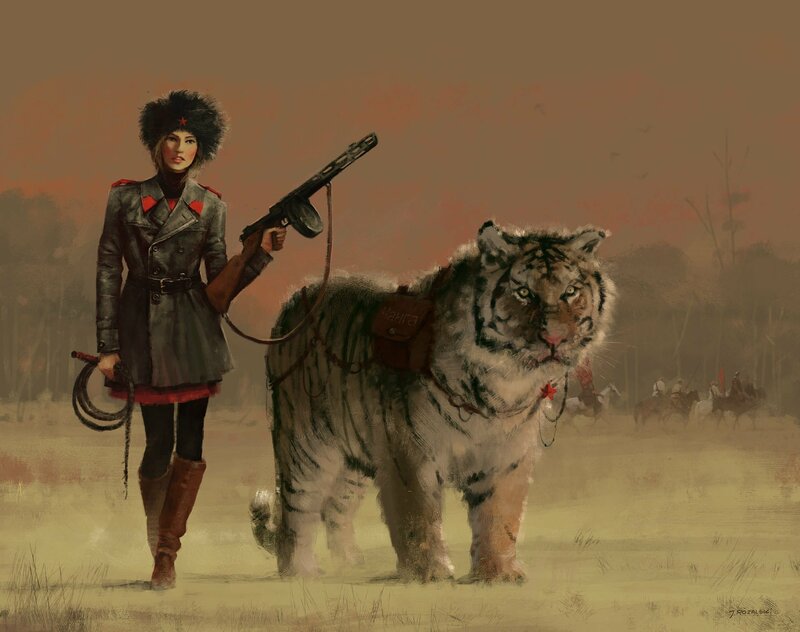 There are reports from the countryside of strange soldiers with glowing eyes, but they seem distant and harmless. 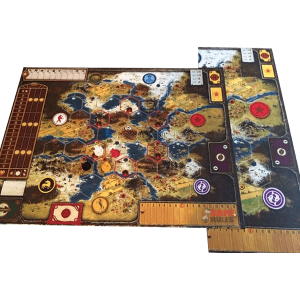 The board extension for Scythe slides next to the back side of the game board, creating a complete board with +50% bigger hexes. 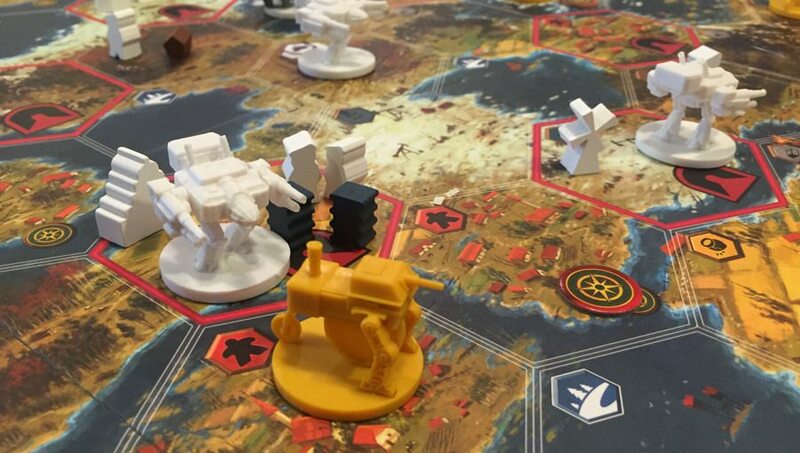 All units and resources in Scythe are kept on the board, so the larger hexes provide more space. 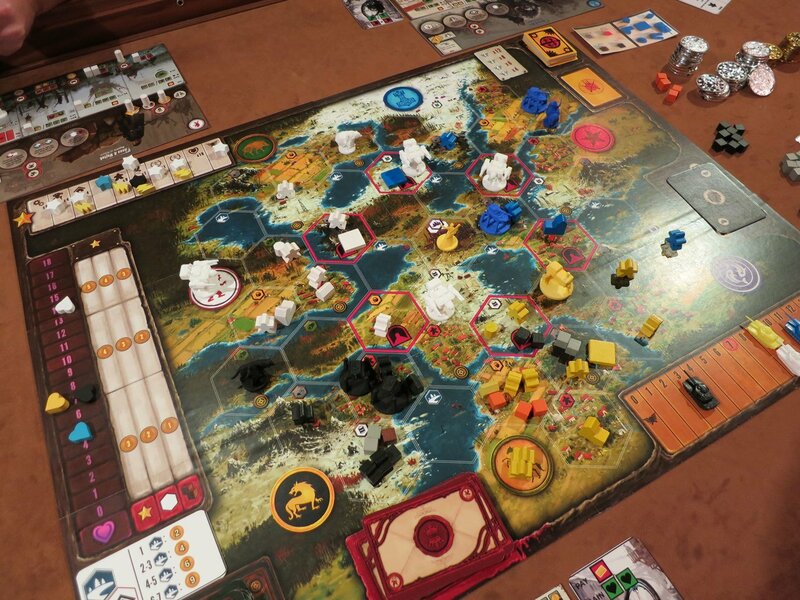 The standard game board is 624x818mm, and it grows to 818x936mm with the extension.